Every now and then, I get the wild idea that I want to drink nothing except one varietal of wine. That’s semi crazy given the vast world of wines out there. However, I gave in this time when the call of Zinfandel was so loud, it nearly gave me a headache. Perhaps it was the fact that Zinfandel Advocates & Producers Festival had just finished. Perhaps it was that I was in a wine store’s Zin section, looking at the Wine Road Barrel Tasting events I’ll be at March 14-15, and found 2 of the wineries Zin’s right in front of me. Either way, I was intent on trying a number of Zinfandels, all in the name of posting it on my wine blog for you! While Zinfandel grapes account for only about 11% of the total wine grapes grown in California, White Zinfandel wine made from those grapes accounted for 10% of total wine sold in the US in 2006. Sadly, that means that red Zinfandel wine hardly gets the attention it deserves. I’ve actually had people tell me they’ve never heard of “red Zinfandel” before. Now, I aim to introduce them to it. The first “Red Zin” I ever had was at a Christmas dinner thrown by some very good friends. It wasn’t expensive, but the flavors were so interesting and enticing that it really made the meal. We paired the red zinfandel with with a standing rib roast, not a “classic zin pairing”, but the spice and dark fruit of the wine really went nicely with the beef. Since then, I’ve been on the hunt for more red zinfandel wines that I can really get into. You may recall that I had done a “Grocery Store Zinfandel” tasting for the Twitter Taste Live Blogger’s Take Over event. While the wines were nice enough, none REALLY popped my cork, so to speak. Therefore, I am very excited to try the 6 or so Zin’s I’ve got, including the two I’ll write about today, and let you all know about it. 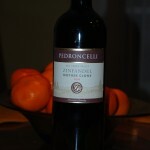 The first bottle I opened was Pedroncelli 2005 Mother Clone Zinfandel from Dry Creek Valley, Sonoma County. With a suggested retail of $12, I was very excited to try this wine. 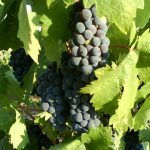 The land for the Pedroncelli vineyard was purchased in 1927, and the wine today includes grapes that were cloned from the “Mother” vines, which are some 99 years old. The wine is fermented in steel tanks, and aged in American oak for 15 months. Interestingly enough, the Pedroncelli technical information on their page has it aged for 12 months, while the writeup says 15. The wine is 94% Zinfandel and 6% Petite Sirah. I next ran the Pedroncelli zin through the Vinturi aerator, which has the affect of letting it breathe for about 45-60 minutes. The nose showed a lot more fruit, and much less spice. That was quite pleasant, and I really liked the aromatics of this wine. The palate softened a lot, and some blackberry fruit showed through much more clearly than without decanting. I felt it was a little “green”, perhaps, as if a blackberry fruit was picked just a few days too early, and wasn’t quite ripe. It definitely showed a bit nicer with the steak, however and it wasn’t quite as green, and had a bit more blackberry notes to it. All in all I thought the wine was enjoyable, and at $12 it was worth the drink. I think this red zinfandel paired nicely with the steak, and I’d actually like to put it up against some smoked ribs and see how it holds. 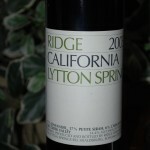 The second bottle of the night was the Ridge Lytton-Springs 2005 Zinfandel. This wine is a blend of 77% zinfandel, 17% petite sirah, 6% carignane and has 14.4% ABV. A mixture of ancient vines, as the Lytton East vines are over 100 years old, and old vines with the Lytton West being planted in the 1950s, the resulting wine goes through natural malolactic fermentation and is then aged in American oak for 12 months. Without any decanting, right out of the bottle there is tons of luscious berry on the nose, and it was quite inviting. The palate was dry, subtle and subdued, however it still wasn’t elegant and silky, but a tad rough. Black raspberry fruit was prominent on the palate, but not sweet and the mouth feel was definitely a bit “soapy.” I felt the finish was a tad bitter, as though it was decent at first but then left an unpleasant afte taste. I also ran the Ridge Zinfandel through the Vinturi aerator, to see how it would be after some decanting. The nose changed a little, with pretty good fruit and perhaps a little sweet bubblegum in the bouquet now. The palate, however, really changed and mellows a lot with some time to breathe. The mouth feel is much silkier, and it was a bit more elegant. The wine really shows some nice black fruits now in the mouth, with the subtlest hint of a cocoa component. There was the undercurrent of some spice, but it really didn’t break through. I felt the wine was still a bit dry on the finish, but overall it really improved. However, I must be honest and say that at $28 retail, I’d probably look for some other values before turning right back to this wine. Not that it wasn’t good, but I just feel that there are a few better Quality to Price ratio Zins out there. 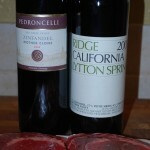 Both of these wines needed time to open up, and both really went well with the steak. As I said, I’d like to put them both up against some Bar-B-Que to see how they hold up. I love smoking some baby back ribs and having a nice glass of Red Zin with them. Perhaps we’ll do that this weekend and see what turns out. I would definitely give both of these wines another look, and plan on it when I’m out in Dry Creek for the March 14-15 Wine Road Barrel Tasting tour. Hopefully I can get to both wineries, but if not, I’m sure I’ll find their wines to sample again. Thanks for stopping by, and I hope you have a good time with wine soon!